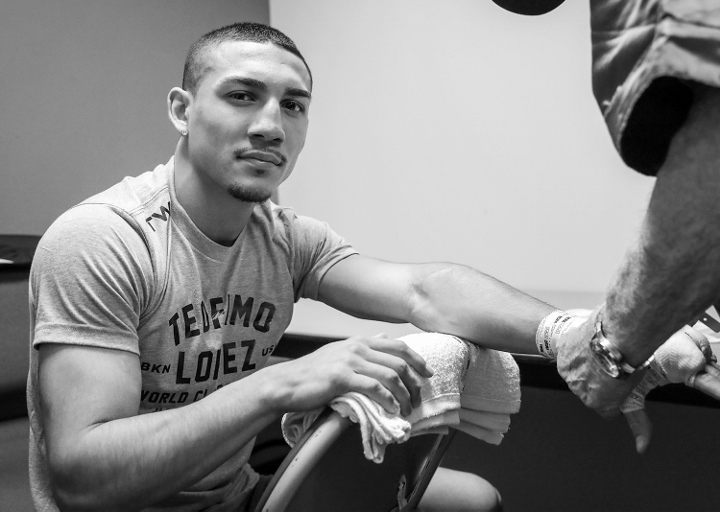 Rising lightweight contender Teofimo Lopez (12-0) has big plans but first must take care of business against Edis Tetli (31-2) on April 20th at Madison Square Garden in New York. The fight is part of a four fight ESPN pay-per-view event. In the main event Terence Crawford faces former champion Amir Khan. While he is still relatively unexperienced as a professional with only 12 fights as a professional, Lopez hopes to fight for a world title in the near future. In fact, if he comes out of the fight against Tetli unscathed, he is hoping to fight for a championship this summer. "They have been talking about, it has been in the works, that in July we will fight for a world title. This fight with Edis Tetli was a 10 rounder and now they bumped it up to a 12 rounder. I think it is an IBF title eliminator. It could be an eliminator for one of the belts - most likely the IBF - then hopefully we can face Richard Commey," Lopez recently told BoxingScene.com. Commey and Lopez both fought on the Sergey Kovalev-Eleider Alvarez undercard on February 2nd. Lopez dispatched Diego Magdaleno in 7 rounds while Commey blasted out Isa Chaniev in 2 rounds to capture the IBF lightweight title. Lopez wasn't very impressed with what he saw from Commey, saying that he didn't have much of a an opponent in front of him. "He fought before me. He fought some scrub who was like 13-0 with 6 knockouts and who was already ranked that high. It was like they just found somebody for him to make him look good. Hopefully we can make that fight happen," Lopez opined. Even though he wasn't impressed with his last fight Lopez recognizes that Commey is a good fighter. He just feels that he is a level above him and that it would show if and when they meet in the ring. "He is a world champion so he is a great fighter. Like all these guys that are world champions, Mikey Garcia, (Vasiliy) Lomachenko, they are champions for a reason. But when they face Teofimo Lopez, no!" Said Lopez. Make this fight next. Lopez is a great counterpuncher and Commey's style will give him a big opportunity to shine. [QUOTE=Pigeons;19660627]Test it in the gym. [/QUOTE]That just makes too much sense! [QUOTE=Bronx2245;19660410]He said he needs the tune up to test his hand before fighting Lomachenko! [/QUOTE] Test it in the gym. [QUOTE=Fangedgrowl;19660413]Yep great idea Bronx! Yet we all know how these turn out. . You should promote then. [/QUOTE]I wish I had the money...and the muscle!